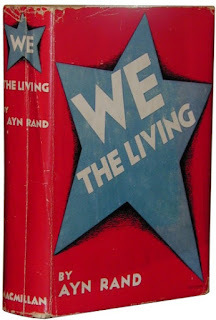 Book Review: We the Living, by Ayn Rand, 470 pages, 1936. In her foreword, Rand states: "We the Living is not a novel about "Soviet Russia." It is a novel about Man against the State." The story, a semi-autobiography, takes place in Soviet Russia shortly after the Revolution of 1917. Kira is the main character. Rand explains that Kira is exposed to the same environment and challenges that she was, but otherwise the story is fiction. We the Living is a sad story. Completely. You'll meet characters who have life's fire burning inside who must continuously adjust their hopes and efforts down to the low bar of socialism. They face the other characters who, like crabs in a bucket, pull the creative, happy and productive down into their sewer. I enjoyed the language of socialism's excuses, as you'll see in my selected quotes. It is a completely different language - the language of the dull, of the excuse. Conversations are Rand's strength in all her books. You'll see winners talking with winners, winners talking with losers, and losers conspiring with other losers. Rand captures these conversations perfectly. There are good books (3 stars). There are great books (4 stars). And then there are Ayn Rand's books (5 stars). We the Living is her first book, and it is different than my absolute favorite books by her, Atlas Shrugged and The Fountainhead. But you can see the connection between the strong woman, Kira, in this book and the ladies of her later books. I recommend this book with no hesitation. I think it should be required reading at the high school level, but I suspect the public school administrators would not like the comparisons with the darker characters. My Book Notes, with selected quotes. 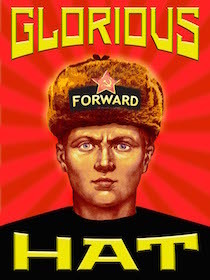 I've added this book to the fiction section of the Ushanka Library at the left. I read the Kindle version of the book - Amazon Link.